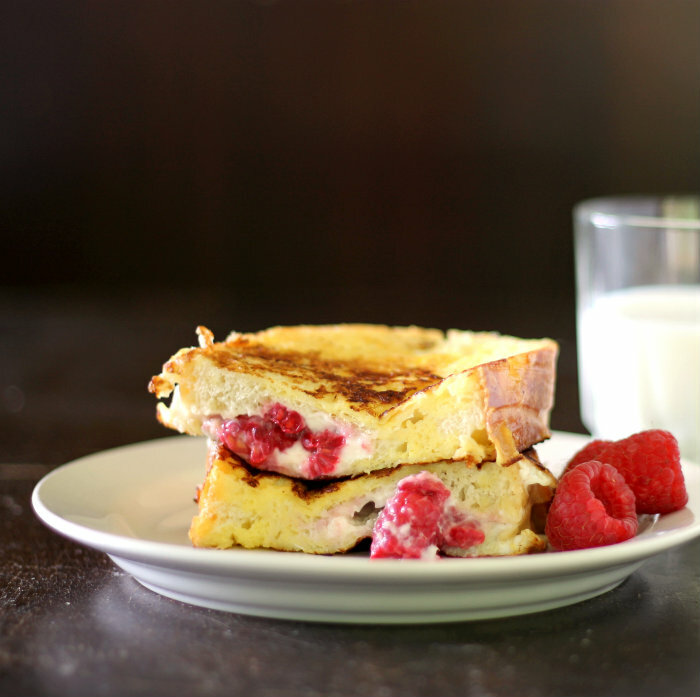 French toast is a great breakfast, but this raspberry cream cheese stuffed French toast is over the top delicious French toast. It was a busy weekend! Spring is here and there is always plenty of work outside to get done. Mike planted the garden this past weekend. I am really excited this year, we are going to have some herbs in the garden this year. Past years I have planted some basil and dill, but this year we have expanded just a little more by adding sage, flat leaf parsley, and oregano. I am hoping to use some of these herbs in new recipes this summer. So, wish me luck that they grow and do well. I spent some time planting flowers around the house and of course working in the kitchen. I made this French toast for brunch for Mike after he was done with planting the garden. He does love his French toast. Me on the other hand I am more of a pancake lover, but after having this French toast I may be persuaded to change my thoughts and declare French toast my favorite. There is a little more work for this French toast than your every day French toast, but it is well worth every extra minute you put into it. 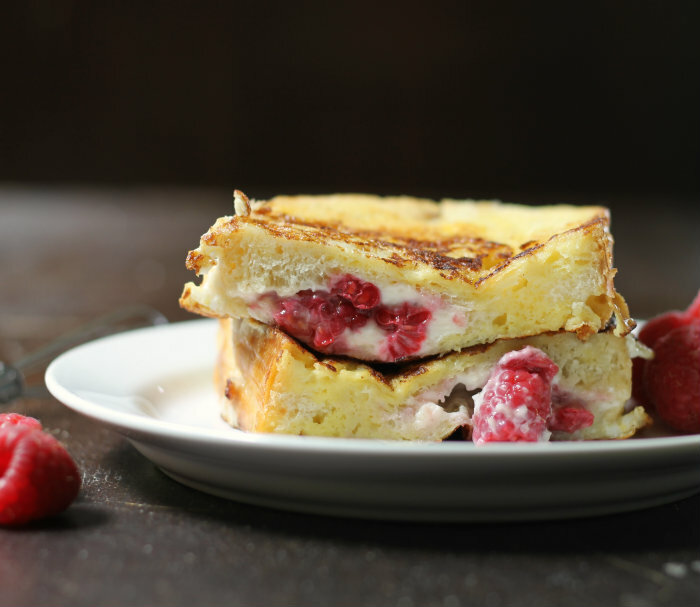 Sweetened cream cheese with the raspberries in this French toast made it seem more of dessert than a breakfast food. Serve it with maple syrup or your favorite French toast topping and I am sure that you will fall in love, just as I have. Toss the raspberries with the teaspoon of granulated sugar and set aside. Beat eggs, milk, and almond extract in a dish that you will be able to place the bread into. Take 1-inch cut bread and carefully cut pockets in each slice. You do not want to cut the bread so that you have two separate piece of bread. Divide the cream cheese into four servings and careful spread on each side of the inside of the pocket. 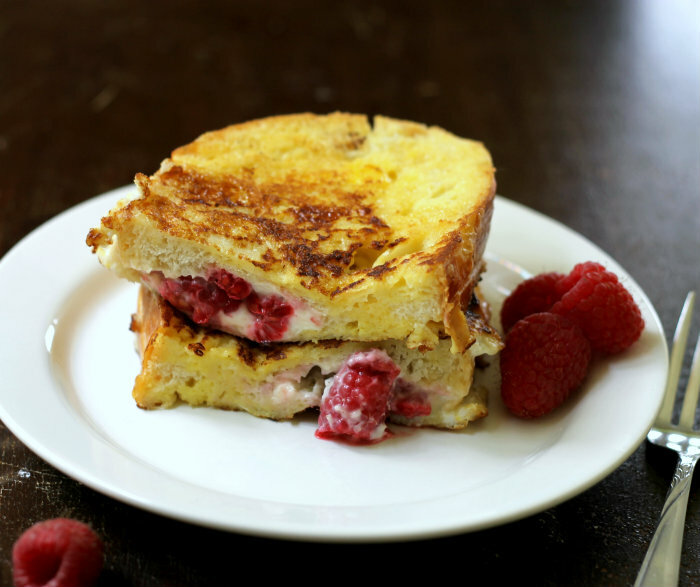 Take the raspberries doing the same divide in to four servings and place them in between the cream cheese. Place the stuffed slices of bread and place them in the egg mixture long enough to saturate each side. Heat a skillet over medium heat add butter and melt, making sure that you have enough butter to cover the bottom of the skillet. Place the bread that has been dipped in the egg mixture in the skillet that has been heated. Cook until the bread is turning brown, flip and brown the other side. By this time the cream cheese with melt slightly. Top with maple syrup or your favorite topping. Serve immediately. Do not over crowd the skillet with French toast, you want to brown the French toast. If you making a large batch keep the French toast in a warm oven. Stuffed French toast = my breakfast happy place!! THis looks glorious. Oh my! !In love with your recipe. truly delicious! 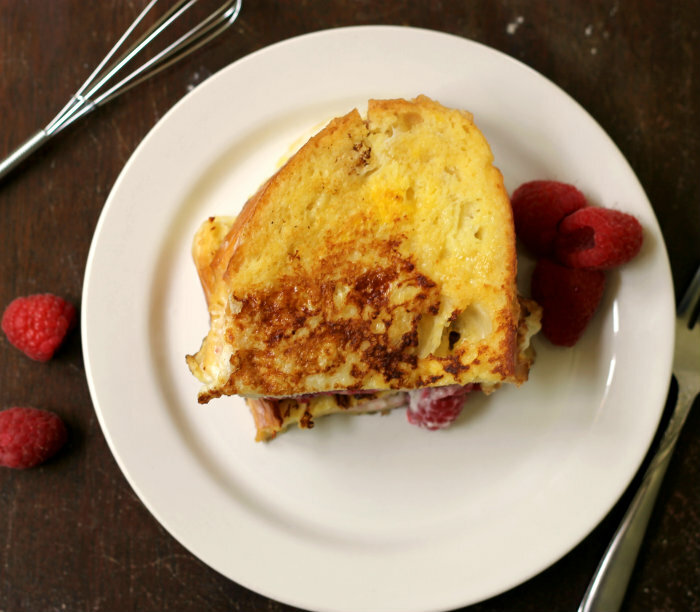 I love stuffed French toast—and I’ve made a very similar version. The family loved it! It’s so nice to have your own herbs, isn’t it? They add so much fresh flavor to dishes! And speaking of flavor, this looks outstanding! Lovely stuff — thanks. This looks fantastic! The raspberry stuffing is genius! I have ever ever eaten French toast like this. Why not??? It looks amazing. There is always a time to start!